It's kitten season, and our local San Jose shelter is overflowing with tiny felines. Many people think they are doing the right thing by bringing a litter of kittens they find, or that their cat has to the shelter assuming the shelter will care for these little kittens. This is not the case. Many local cat rescue groups try to pull these kittens from the shelter and put them in foster homes, but there just aren't enough foster homes to rescue all of the kittens that need it. Did you know that more than 3500 pre-wean kittens are euthanized in Santa Clara County shelters every year? Unfortunately, shelters are not equipped to care for these little ones and do not have staff, volunteers or the money to do this. Unless rescue pulls them and finds experienced bottle-feeding foster homes for them, pre-weans are almost always euthanized. Itty Bitty Orphan Kitty Rescue (http://ibokrescue.org) created the Pre-Wean Kitten Project in 2007 to encourage community involvement in saving the lives of these tiny kittens. As part of the Pre-Wean Project, IBOK Rescue provides Starter Packs (which include emergency supplies such as KMR, a nursing bottle, a flea comb, and kitten food; informational literature; discount coupons; and an instructional DVD) to more than 20 Bay Area shelters and to all 40 Pet Food Express stores. These packs are given out FREE to anyone who finds orphaned kittens. In early 2010 IBOK produced a 30-minute instructional video on how to care for pre-weaned kittens. The video shows you everything you need to know to hand-raise the kittens until they are old enough to be adopted and is available on DVD and online. IBOk has also collaborated with HSSV to develop a training class which is held bi-monthly at their facility and are hoping to offer this class in more locations soon. 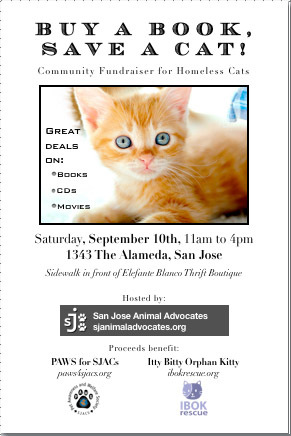 On Saturday, September 10th San Jose Animal Advocates (http://sjanimaladvocates.org) will be hosting a fundraiser called “Buy a Book, Save a Cat” where the proceeds of the event will be split between Itty Bitty Orphan Kitty (IBOK rescue) (http://ibokrescue.org) and PAWS for SJACS (http://paws4sjacs.org). The fundraiser will be held on the sidewalk in front of Elefante Blanco Thrift Boutique at 1343 The Alameda from 11am to 4pm. It will include the sale of books, cds, dvds, cassettes and vhs movies. Both organizations will apply their funds to support their spay/neuter initiatives. Buying several books or CDs will pay for spaying one cat which means less kittens ending up in our shelters with little or no chance of survival.